Lisa Simpson is tired of the routine and has decided to take a bike ride outside of Springfield to breathe fresh air. We will have to help her at these levels because she has gotten into a very dangerous area and may end up having an accident. We are talking about roads full of climbs, descents, potholes and other obstacles that we must avoid to avoid falling to the ground. 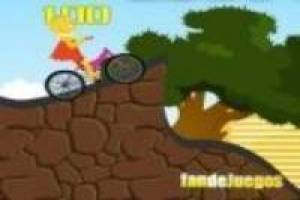 You must complete all these levels controlling Lisa' s bike and be able to finish the game successfully. Along the way you will also find stars that will add points to your score once you finish. You have five lives in total and you must keep them if you want to finish the game. 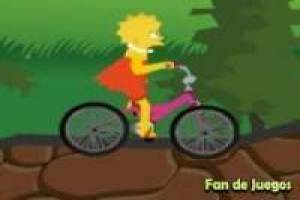 Enjoy the game Simpson: Lisa on a bicycle, it's free, it's one of our the simpsons games we've selected.